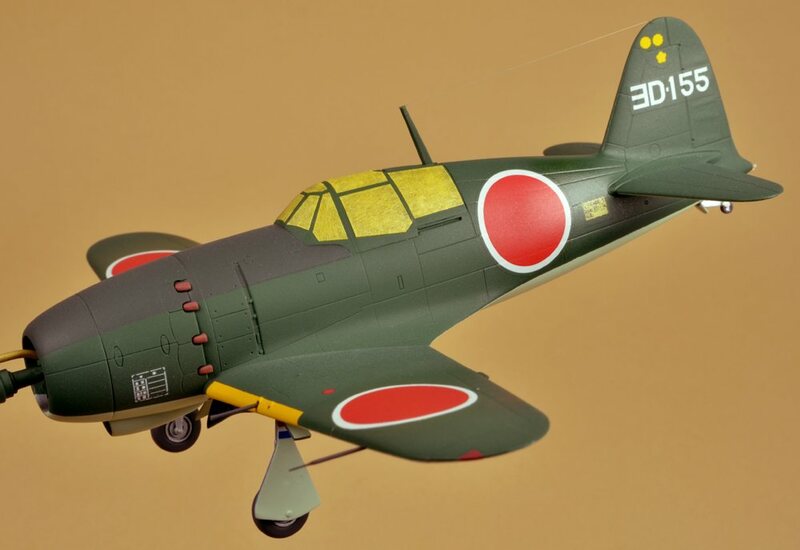 This was my first, serious attempt to build a fighter plane of the Imperial Japanese Navy; as such, I did not have any experience with painting IJN colors. 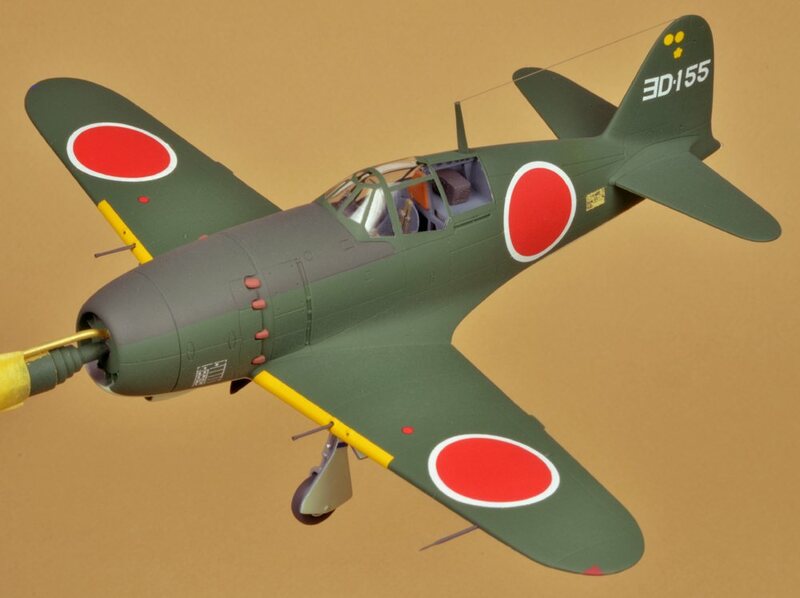 In addition to my copy of Thorpe's Japanese Naval Air Force Camouflage and Markings World War II, which is rich with general color information, I had a copy of the Famous Airplanes Of the World (FAOW) booklet no. 61 on the Jack, which contained color renderings specific to the camouflage schemes for Jacks in WWII. This gave me a starting point for painting the Jack, but I have learned I cannot rely only on the color pages as printed in books, because of broad variations in printer's inks, often on adjacent pages of one copy of a publication. 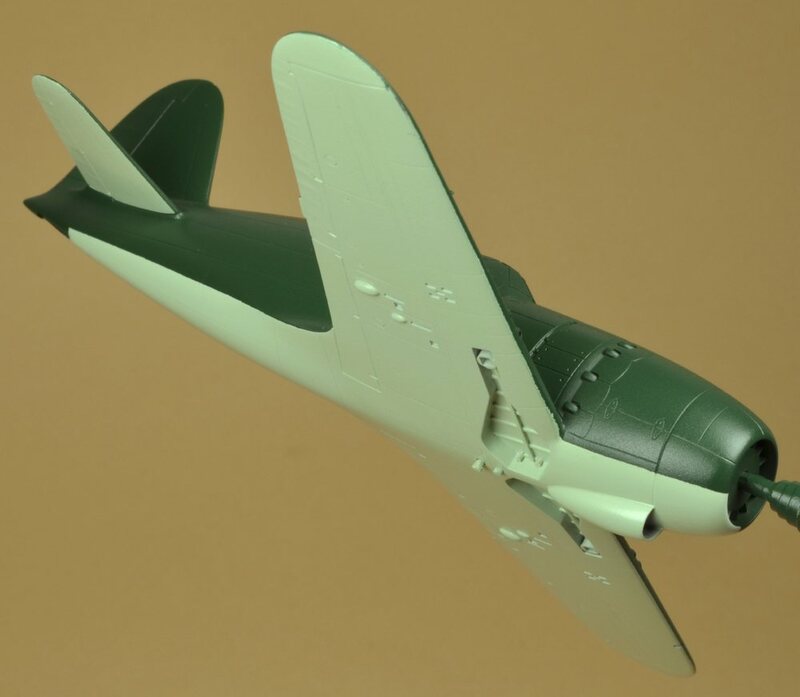 I opted to assume that model paint from the Tamiya Corporation (from Japan, naturally enough) would be as accurate in color as any model paint, so as a resource, I bought one bottle each of Tamiya acrylic XF-11 IJN Green and XF-12 IJN Grey. Since I did not want to learn to paint Tamiya acrylic paints on this model, I painted out small samples of the acrylic paint, and then selected Humbrol enamel paints that were of lighter shades that approximated the Tamiya colors (taking into account the need for scale color, without actually having to add white to the selected Humbrol paints). 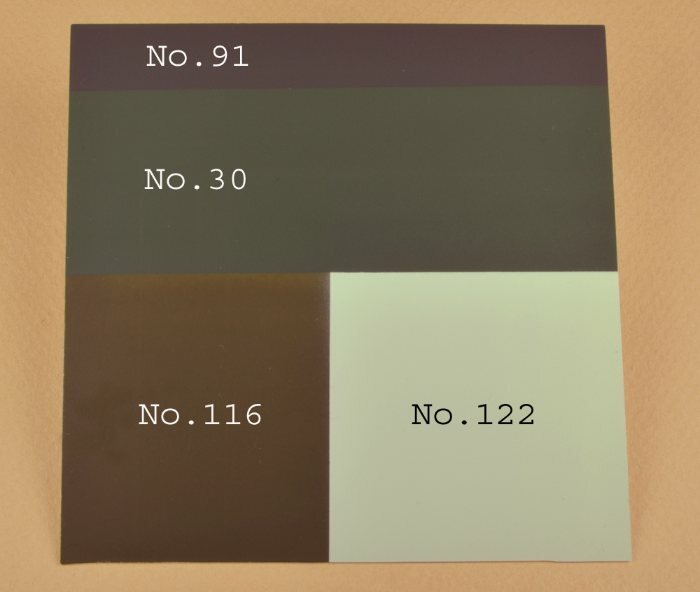 Since the FAOW Jack booklet helpfully showed Jack profiles both in a dark "olive" green, AND in a dark "pine" green, I tried two different Humbrol greens: No. 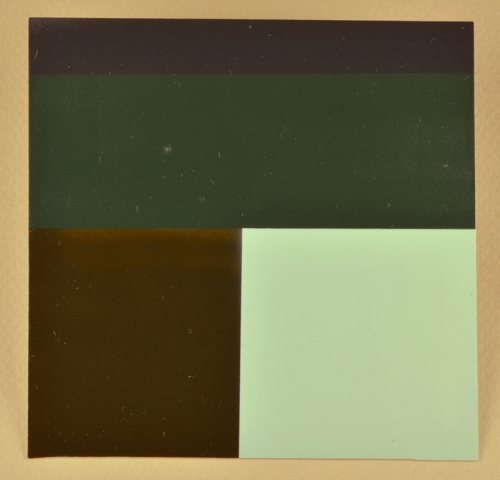 30 Matt Dark Green ("pine") and No. 116 Matt US Dark Green ("olive"). Along with these greens, I airbrushed a square of Evergreen styrene with Humbrol No. 122 Matt Pale Blue (for IJN Grey) and Humbrol No. 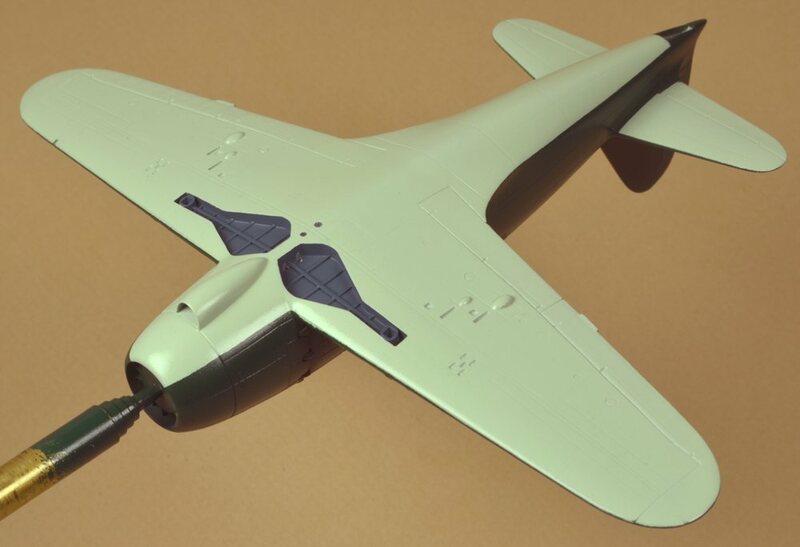 91 Matt Black Green (for the really dark green anti-glare panel on the fuselage, in front of the canopy). 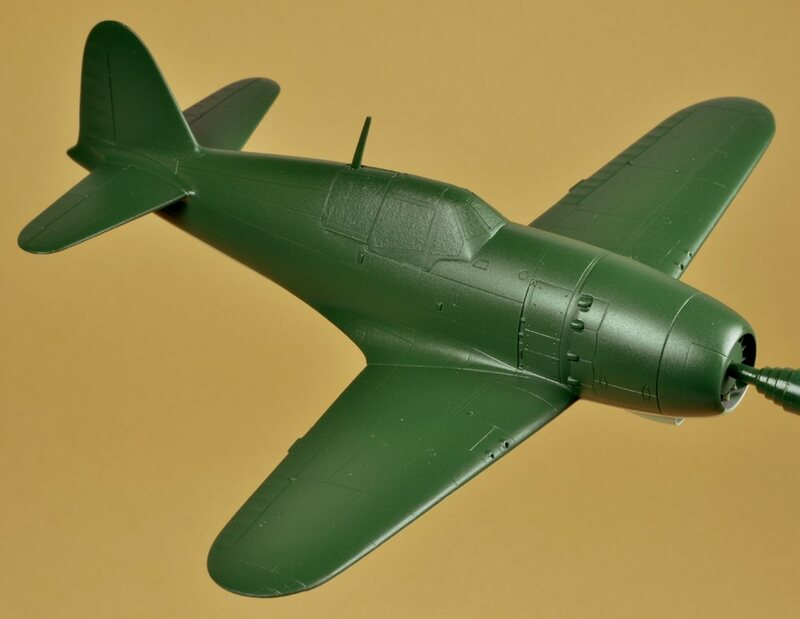 After studying my Humbrol samples, in comparison to my Tamiya base-line IJN colors, plus the David Klaus "IPMS Color Cross-Reference Guide" FS 595a suggestions for the Thorpe IJN colors, plus the (conflicting) color profiles in my FAOW booklet, I opted to go with the "pine" green scheme. I think it will look better. I'll save the Humbrol No. 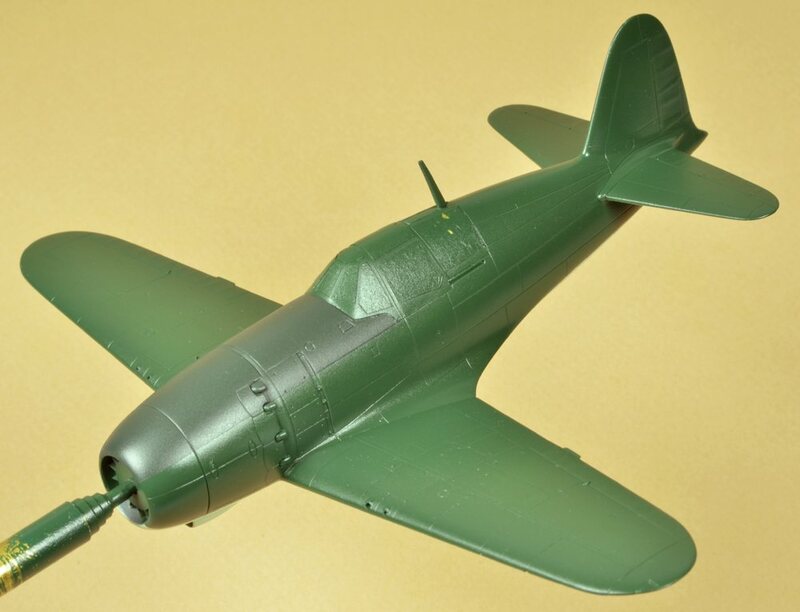 116 Matt US Dark Green for my (future) Imperial Japanese Army Air Force models. For me, anyway, masking canopies is a seriously tedious job. The Tamiya masking tape is the best product I've ever found, but that still leaves me with the task of trying to cut sticky pieces of material to exactly fit (within a couple of thousandths of an inch) some faintly engraved lines representing the border between the glazing and the metal framing of an airplane canopy. 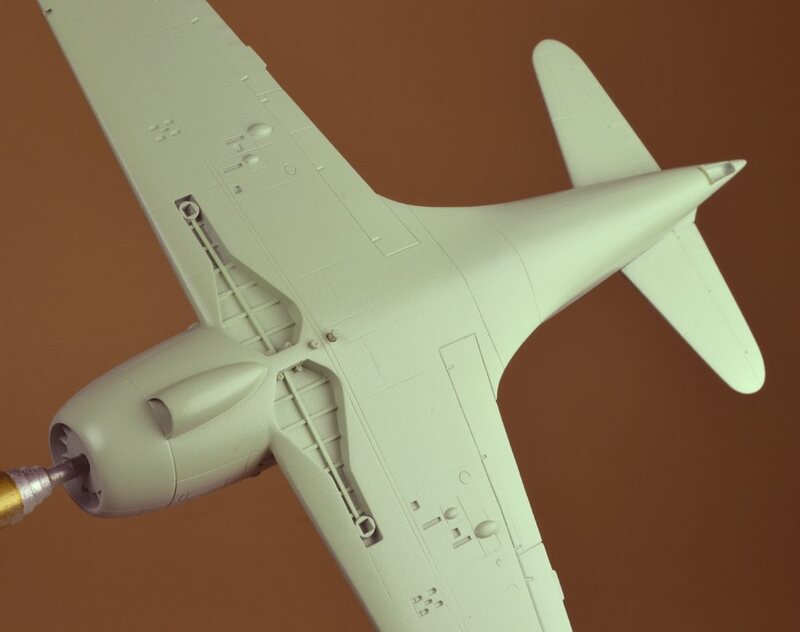 In older kits from the 1960s through the 1980s, model kit manufacturers often made the canopy metal framework substantially raised above the surface of the glazed areas. This wasn't very realistic, but it made the canopy much easier to mask. You could gently press the masking tape down on to the recessed glazing, and if you were very careful, you could painstakingly guide a new No. 11 X-Acto blade along the side of the raised framing, cutting away the excess masking tape. The raised framing also helped conceal imperfections in your masking. 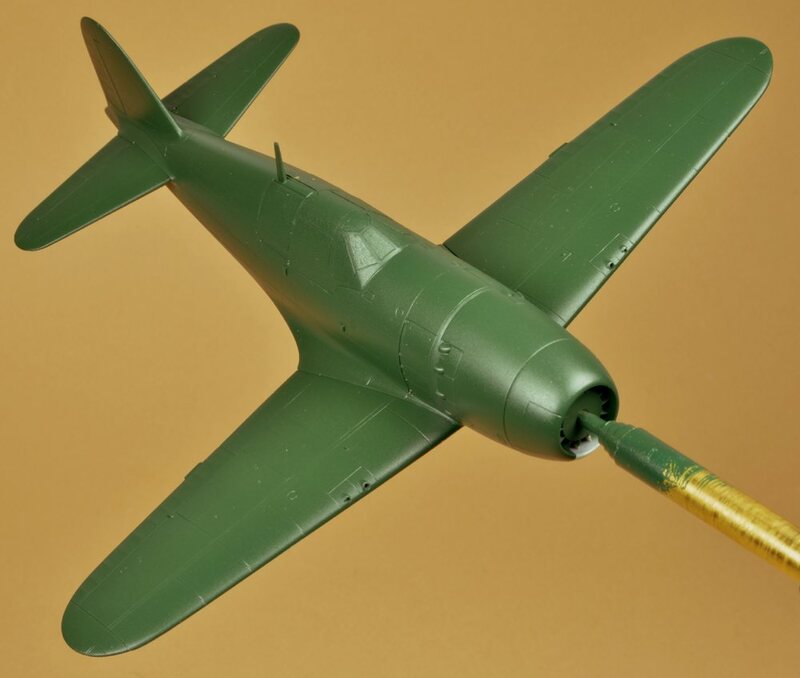 However, as model kit manufacturers competed to produce ever more accurate plastic models, someone realized that on real airplanes, the difference in height between the metal and glass was imperceptible at 1/72 scale, so the finely engraved lines became the standard demarcation between metal and glass. Much more authentic, but much more difficult to mask. On the Jack model, the canopy has engraved lines. The Tamiya tape is opaque, so there is no way to apply the tape and follow the engraved lines with a sharp X-Acto blade. 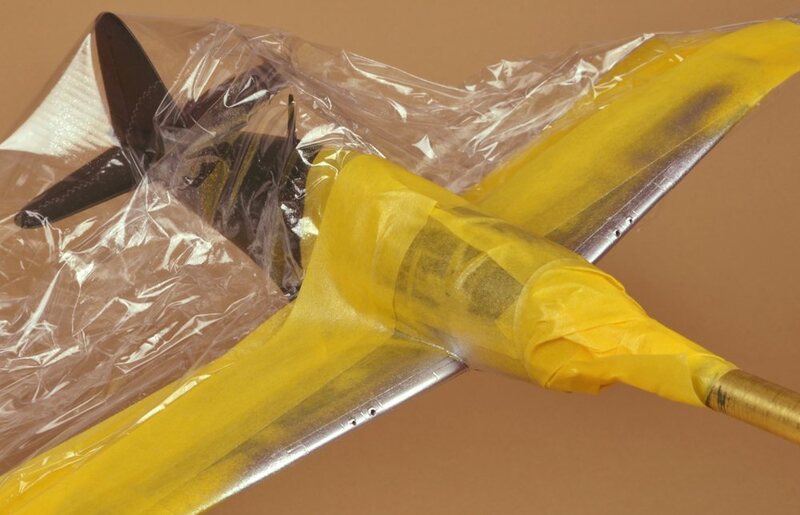 Cellophane tape is transparent, but has two flaws for masking model canopies: it often leaves adhesive residue behind on the canopy when it is removed, and it can't conform to compound curves, which are usually standard on at least some part of most canopies. My technique for masking works, but it is time-consuming: I cut a piece of Tamiya tape from the roll and apply it to a piece of very clean (with denatured alcohol) glass. With an Olfa knife and a steel straight edge, I cut one straight edge in the tape, and then (by eye) cut a second edge at an angle that is my best guess for the first corner of the glazing I intend to mask. I carefully lift the tape off of the glass (no stretching the tape, please) and try it on the canopy. I note (again by eye) how far off the cut angle is from the angle on the canopy, put the tape back on the glass, and recut the angle. Test fit, retrim, test fit, until that corner is correct. Back to the glass, cut the tape for the second corner. Test fit, trim, test fit, trim. 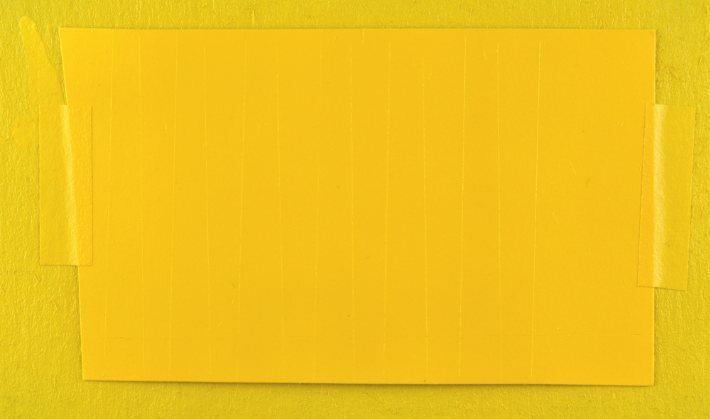 Once my piece of tape looks good for three of the edges, I can start to mark the tape with a very sharply pointed pencil, for the fourth and fifth cuts. If I am very careful (and lucky), I might get this one mask right on the first try. It takes a lot of practice. On to the next mask, and so forth, until the canopy is covered. On the Jack, I was able to get eight of the eleven masks right, on the first try. However, on two of the other three masks I had to make more than four attempts. I still think this is a better hobby than online poker or heavy drinking. Maybe. The last steps are to very gently burnish down the edges of the masks with a blunted round toothpick, and then gently apply a new piece of Tamiya tape to the exposed canopy frames, to pull off any tiny bits of adhesive or tape backing that don't belong. Now, I'm finally ready to start painting. I recently installed a new number 3 needle and number 3 color cone in my twenty-five-year-old Paasche double-action airbrush (I found these replacement parts on a trip to Fredericksburg, Virginia, last March). Unfortunately, I did not notice that I had installed a number 5 needle guard around the number 3 color cone. Until I scrutinized the needle guard, I could not understand why I was getting such a rough pattern of spray out of my airbrush. I tried adjusting the air pressure, and the viscosity of the paint, to no avail. Regrettably, the discovery of the mis-matched airbrush parts occurred after the application of the Humbrol Matt Pale Blue. The result was a very rough surface to the IJN Grey finish, on the underside of the Jack. Hopefully, the application of "Future" clear acrylic will smooth it out, a little. I'm ashamed to admit that I can accept that this rough finish will be less noticeable because it's on the underside of the model. We'll see if I'm correct. Note that with the paint on, it's easier to see where I filled the seams between the bottom of the fuselage and the lower wing, and rescribed the lines for the flaps and fuselage panel lines. It's also easy to see where I need to go back and fill the joints between the upper and lower wing halves, near the wingtips. With the undersurfaces of the Jack painted, however badly, I then airbrushed "Future" acrylic floor wax on to the paint samples, to see how the "wetting" effect of the clear acrylic would affect the raw paint. I had no worries about the Humbrol No. 122 Matt Pale Blue for the lower camouflage, but this step might tell me that I needed to select an even lighter "pine" green Humbrol paint for the upper camouflage. Applying the "Future" really changes the colors, doesn't it? From the results here, I think the No. 30 Matt Dark Green will be fine. Note how the studio lights are reflecting off of all of the dust particles that floated into the "Future", when I sprayed the samples. I don't worry about dust in the paint samples, but I will take care to minimize the dust getting on the model, when the time comes to paint the Jack. While I had the "Future' in the airbrush, I sprayed the IJN Grey-painted undersides of the Jack, as well. Spraying "Future" on to a painted area of a model has two advantages: First, the smooth, glossy finish of the clear acrylic makes a better surface on which the Tamiya masking tape can adhere, than does the rougher, matt finish of the enamel paint. Second, with the "Future" acrylic as a barrier between the Humbrol lower camouflage and the Humbrol upper camouflage, I can, with great care, use a Q-Tip very lightly wetted with Humbrol paint thinner to very gently swab away any rough edges along the demarcation between paints. This trick will work for only a couple of swipes in any one spot, and only (after removing the masking tape) immediately after airbrushing the second color. Too much thinner or too many swipes can disrupt the clear acrylic, and start to damage the paint under the "Future". Once I get to painting the upper surfaces and unmasking the lower surfaces, we'll see if this repair is necessary. Once the "Future" clear acrylic undercoat was thoroughly dry, I started masking the undersurfaces, to demarcate the border between the lower camouflage and the upper camouflage. Long ago, I learned never to use the raw edge of the masking tape, as cut in the factory, in part because it is rarely very crisp and straight, and also because the factory edge will have invariably picked up many tiny bits of dust, dirt, cat hair, etc. I applied a strip of Tamiya masking tape to a piece of glass, as straight as possible, and then slit two or three even more narrow strips of tape, using an Olfa knife (razor sharp, snap-off blades) and a steel straight edge. It was these new, freshly cut edges of the masking tape that I used on the model, to mask the change of color. Thin strips of Tamiya tape are also much easier to curve as needed, and adhere better to compound curves on the model. I applied the Tamiya masking tape to the model, following the illustrations in my references (pick one and stick with that one; they all vary, even within the same publication). Once the demarcation between colors was fully outlined, front to back and wingtip to wingtip, checking constantly for symmetry as perfect as humanly possible, I filled in the rest of the masking area with bigger pieces of Tamiya tape. This was boring. Trust me. As a last step, I very gently burnished down the edge of the tape with a blunted, round toothpick, to ensure that there are no raised edges where the next color can bleed, ooze or otherwise flow where it doesn't belong. 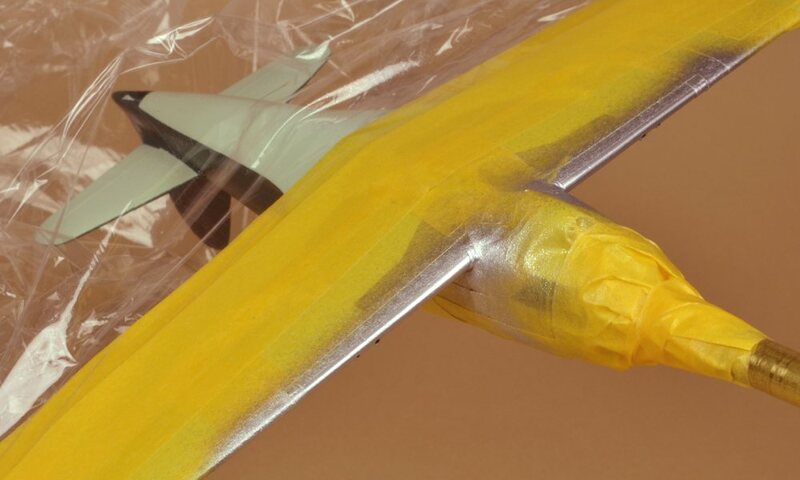 On very rare occasions, where the demarcation is between very highly-contrasting colors, and/or on a very prominent area of a model, I will airbrush more of the underlying, masked color, on top of the masking tape, so that if there is any bleeding of paint, under the mask, it is of the same color. Wish I had thought of that trick on my own, but I read about it in some now long-forgotten modelling magazine. 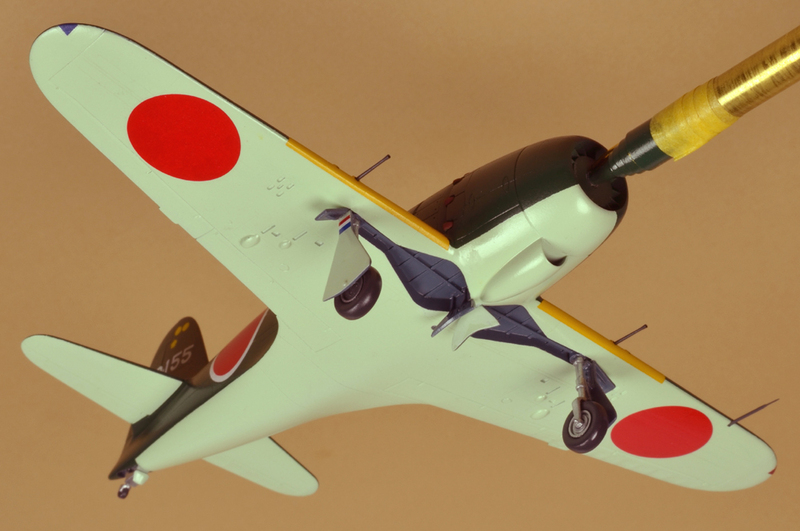 I opted not to take this precaution on this model, mostly because I think the Tamiya tape is that good. Here is the Jack with Humbrol No. 30 Matt Dark Green airbrushed on the upper surfaces and the masking removed from the lower surfaces. The masking worked pretty well, for the most part. For some reason, the leading edges of the wings were particularly rough. I tried my Q-tip-with-thinner swabbing trick, and also a light sanding with a polishing stick, which helped some, but I'll have to do some touch-up painting. 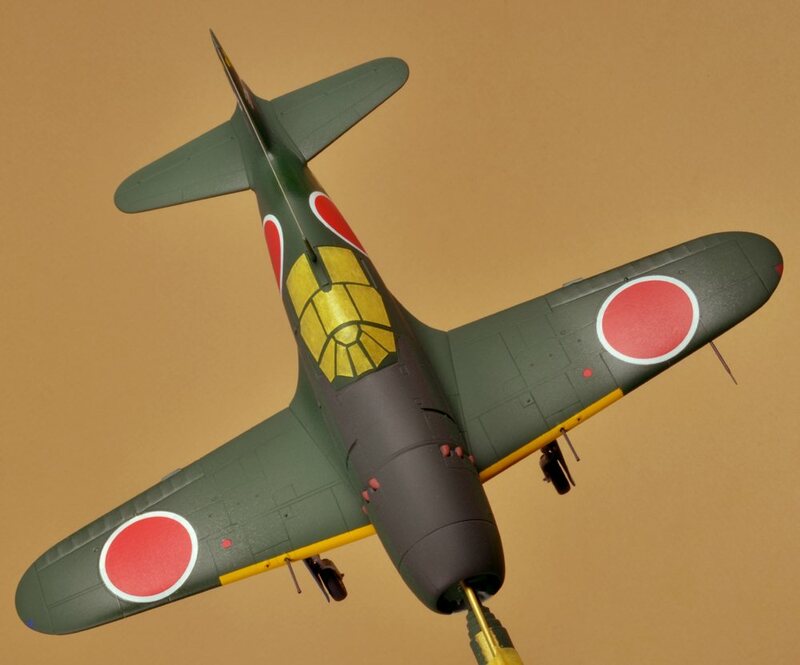 Hopefully, when I add the yellow panels ("Friendly Aircraft Identification" markings on nearly all Japanese WWII aircraft) to the leading edges, it will hide some of the rough demarcation work. As a photographic aside, note how the color of the background (a single sheet of tan art paper, used through-out this entire project) changes in relation to the color(s) of the model in the foreground. 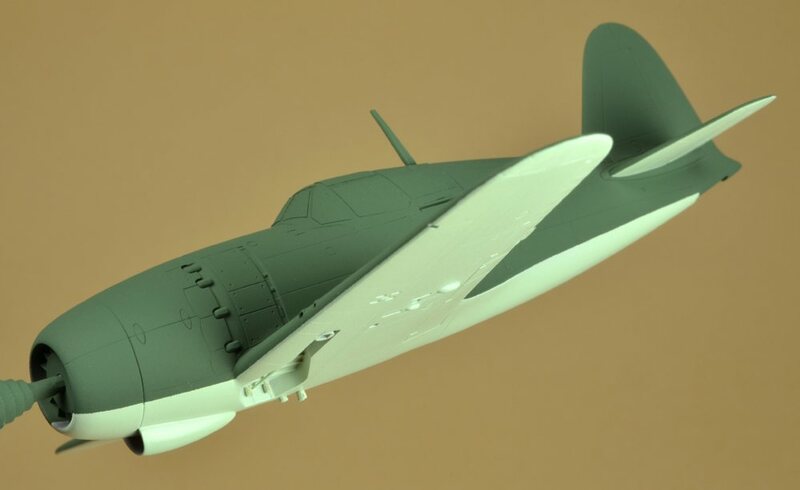 I have been adjusting the color balance of the images, in PhotoShop 6.0, aiming to achieve a more true-to-life appearance of the model in the photos, and usually the background came out more or less the same, but now that I've been photographing the IJN Grey and IJN Green, the background has become much less uniform. The entire model has been airbrushed with "Future" clear acrylic, in part for applying the decals later, but also to continue to aid the application of masking and paint. Note how the sheen of the "Future" really brings out the details on the surface of the model. Not all of this effect will be lost, after I apply the clear flat finish (ModelMaster Flat Lacquer). The trick to applying "Future" clear acrylic floor wax is to airbrush at a lower pressure than that for pigmented paint, and to constantly "roll" the model through the axis of the brass tube holder, like a chicken on a rotisserie, so that the thin, wet "Future" doesn't run or sag, due to gravity. Also, you need to try to maintain a very low dust environment while spraying the "Future", otherwise dust particles drift into the wet "Future" and become a permanent part of the model. Not very "scale", or authentic. You can see how rough the masked demarcation along the right wing leading edge turned out. I'll try to fix that, soon. But for now, it's time to mask the other parts of the aircraft. 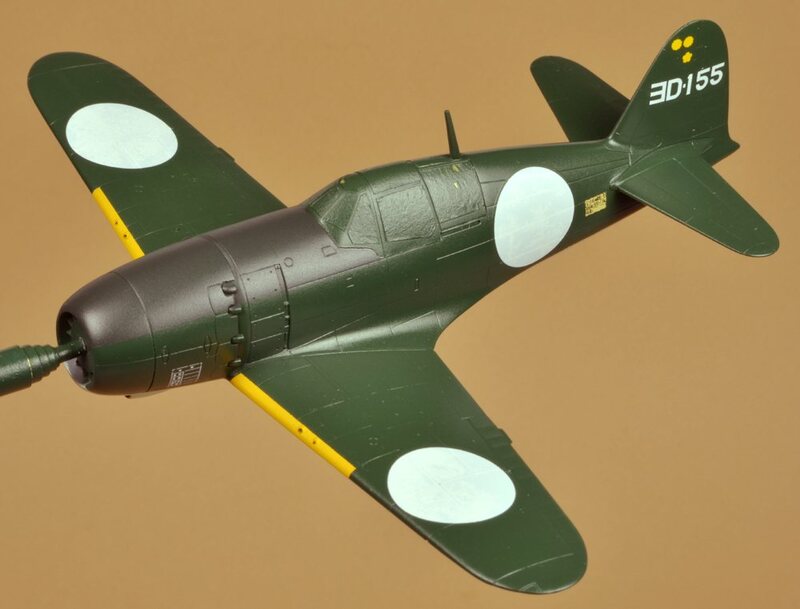 On real fighter planes, to prevent the pilot from being blinded by the reflection of the sun off of the top of the fuselage, in front of the windscreen, this area was often painted in a dark-colored matt paint. On the Jack, this color appears in the references to be a black green color. I chose to use Humbrol No. 91 Matt Black Green. But first I had to mask the entire model around this area. 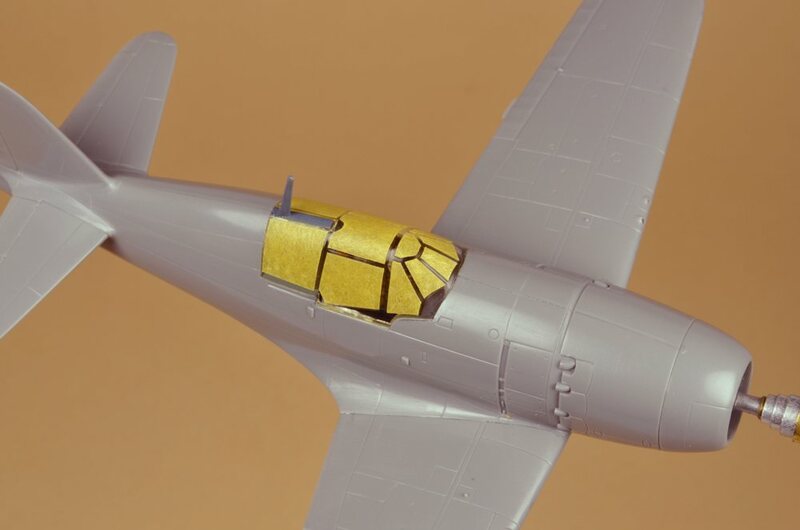 I outlined the part of the fuselage and windscreen that was to remain the upper camouflage color with thin, flexible strips of Tamiya masking tape. Around the windscreen, I cut small blocks of tape to follow the edges of the windscreen framing. After the anti-glare area was outlined, I added progressively wider swathes of masking tape, until I reached a point where I knew I could cut out and tape down a piece of Saran-Wrap clear film, to cover the rest of the model. 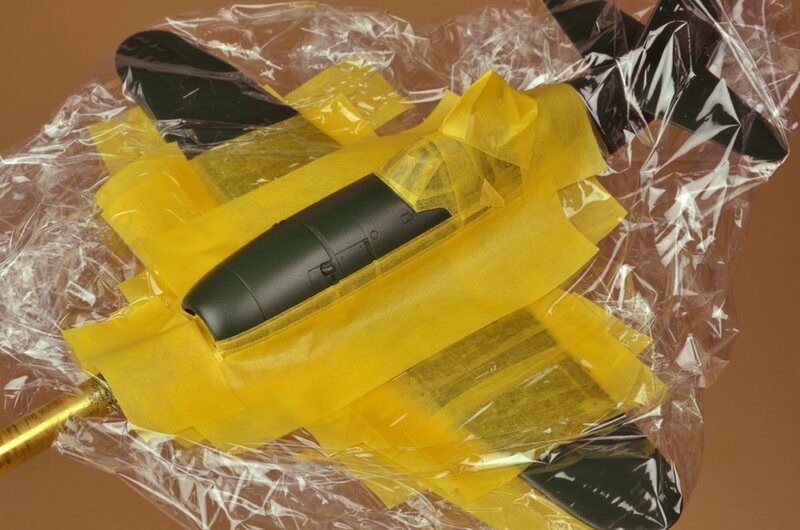 This trick saves a lot of time, and lots of (relatively) expensive masking tape. While I was masking the entire model for the anti-glare panel, I masked the landing gear wheel wells as well. Here, rather than outline the wheel well openings with thin strips of Tamiya tape, I applied a wide piece of masking to each entire wheel well. Because the color of the tape was noticibly lighter where it spanned across the opening, vs. the darker color of the tape where it adhered to the model, I could see very well where to cut the mask. With the tip of a brand new X-Acto No.11 knife blade, I carefully sliced through the masking tape, using the vertical edge of the wheel well as a guide for the blade. I had to use a very light touch, to not gouge the plastic of the wheel wells with the super sharp X-Acto blade. Once the wheel wells were surrounded by masking tape, I added more broad strips of tape, until I could fold the Saran-Wrap from the top of the model around, front and back, to cover the bottom of the model, taping the Saran-Wrap to the masking tape around the wheel wells. Now, the entire model was covered with Saran-Wrap, except for the exposed surfaces where the paint for the anti-glare panel and the wheel wells would be airbrushed. I airbrushed Humbrol No. 91 Matt Black Green on to the area for the anti-glare panel, and Humbrol No. 144 Matt Intermediate Blue at the wheel wells. Once the paint was dry enough (about as long as it takes to clean the Paasche airbrush), I removed the Saran-Wrap and masking tape. The results were pretty good: I used the Humbrol thinner-soaked Q-tip trick to clean up the demarcation between the "Future" clear acrylic barrier on the lower surface camouflage paint and the fresh wheel well paint. Before I started to apply the decals (Japanese national markings, codes and symbols) to the Jack, I painted the detail parts. These won't be installed until after the decals are applied, but this paint can be drying while the decals go on. After many years' experience, I've learned that I get the best results by always airbrushing every part possible, even the small parts. The finish from airbrushing is usually thinner, smoother and much more uniform in appearance than brush painting, at least for me. According to Thorpe and my other references, including the FAOW on the Jack, the propeller blades, spinner and cooling fan base should be a dark red-brown, so I used Humbrol No. 186 Matt Brown. The landing gear struts, tail wheel support, wheels and the bushing between the propeller hub and blades I airbrushed with Humbrol No. 27002 Polished Aluminum, to simulate bare metal. The tires for the main and tail wheels were hand-painted with Humbrol No. 67 Matt Tank Grey, heavily-thinned and using a very pointed paint brush. The cannon barrels were airbrushed with Humbrol No. 67 Matt Tank Grey. 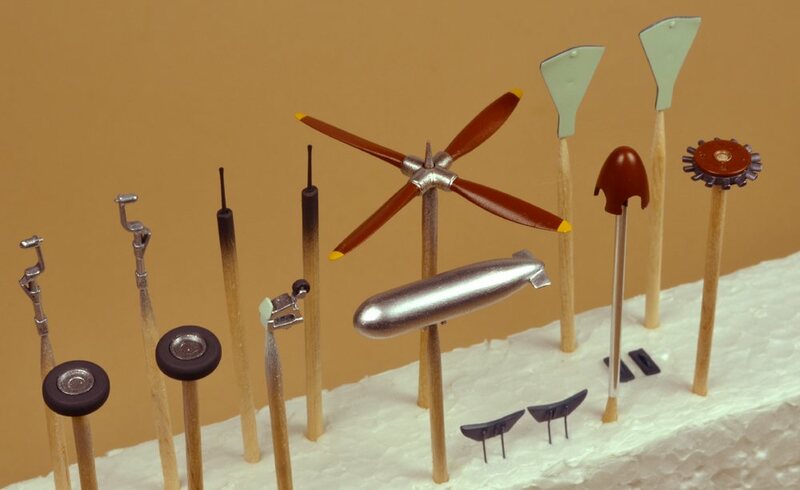 The cooling fan blades were airbrushed with Humbrol No. 27003 Polished Steel, then buffed up with an old, soft, dry paint brush. 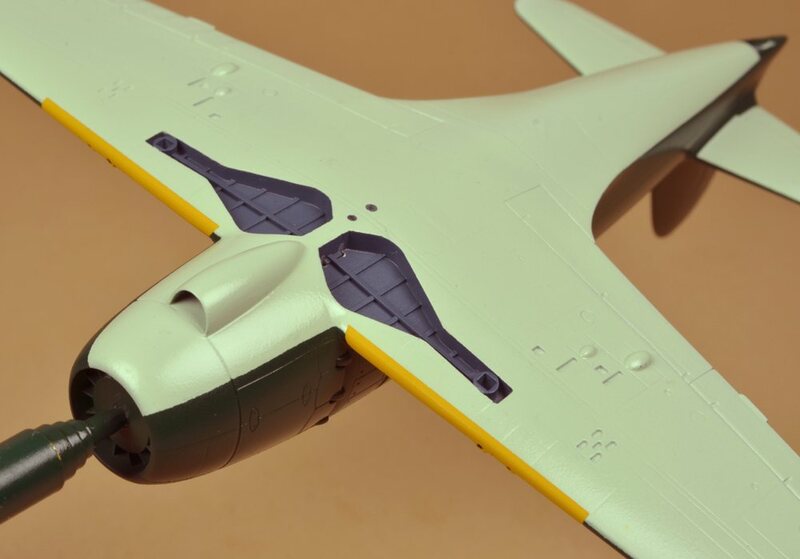 Rather than trying to mask and paint the wing leading edge "friendly aircraft" yellow markings directly on the model, I painted white sheet decal material with Humbrol No. 154 Matt Insignia Yellow. I pre-cut the markings on the decal, to avoid chipping the yellow paint by cutting after painting. 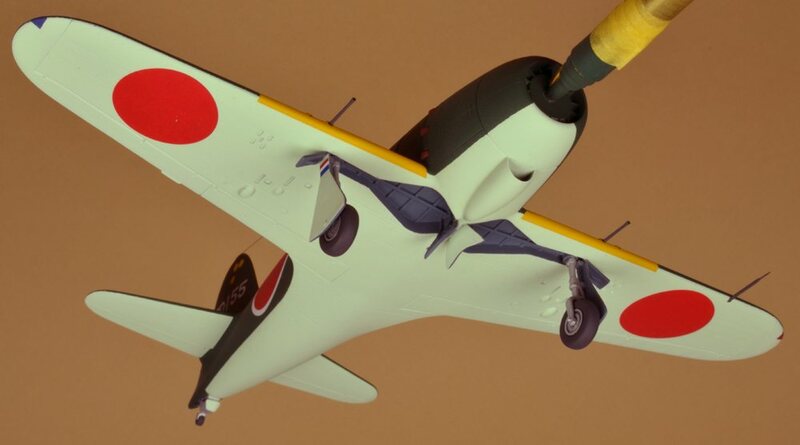 I had planned to add the typical Japanese "Friendly Aircraft Recognition" yellow markings to the leading edges of the wings on the Jack using the decals I had cut and airbrushed (see above), but the decals were a complete failure. When I tried to apply the first decal, it became obvious that either the decal film, or the white pigment on the film, or both together made the decal so stiff that it wouldn't wrap around the leading edge of the wing. As a result, I had to mask the entire model again, leaving only the areas for the yellow markings exposed, so I could airbrush the markings. 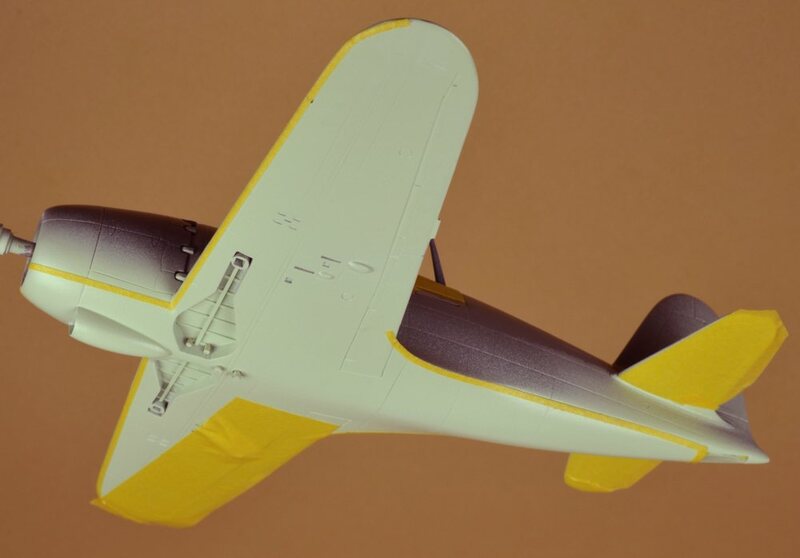 Light colored model paints, especially white and yellow, are difficult to paint on a model and achieve good opacity, particularly on any dark underlying plastic or paint. Usually, you paint the lightest colors first (as I did with the lower camouflage), but I did not want the yellow markings to preceed the dark green camouflage. 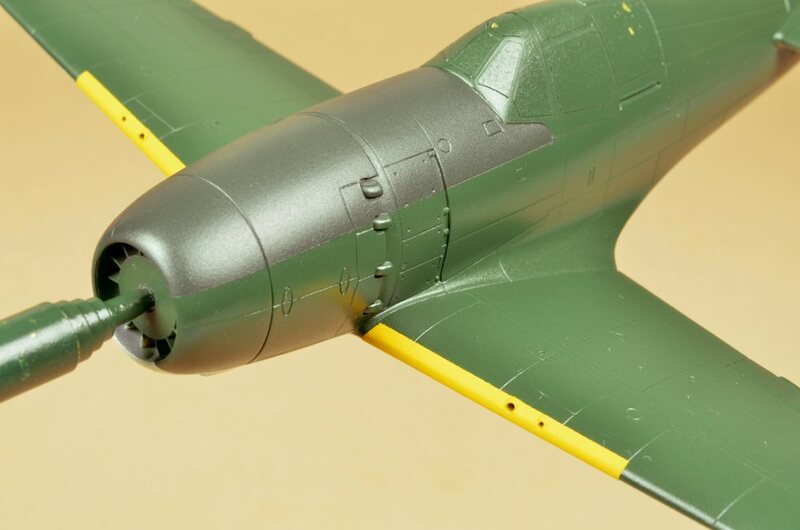 Generally, you want the ridge at the demarcation between colors to be from adding the smaller patches of paint to the larger areas of paint on the model. One way to boost the opaqueness of white or yellow paint is to apply an undercoat of silver or aluminum paint. Silver is perfect as an undercoat: it covers any color, no matter how dark, with only a very thin application of paint. Thin is good, because too thick an application of any masked paint, and a tiny edge of that color becomes visible, at the line of demarcation. Fortunately, the aluminum, then yellow, airbrushing seems to have worked well. One word of warning: silver/aluminum paint is often very fragile. The vehicle of the paint cannot bind the metallic pigment together as well at it can bind color pigments. As a result, you usually can't trust the metallic paint to withstand the application of masking tape, prior to painting other parts of the model. Consequently, when I need to have metallic areas visible on a model, I try to apply the metallic paint last. 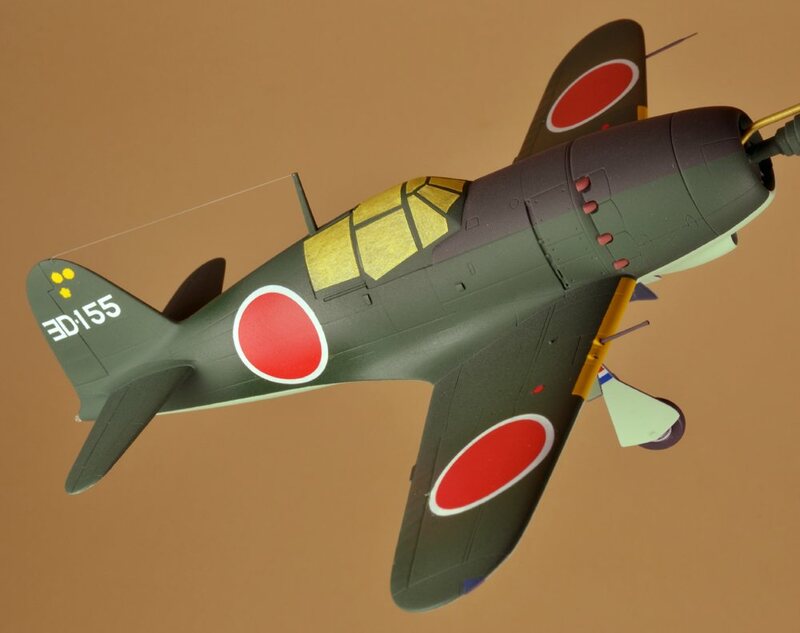 The Hasegawa kit-supplied decals for the hinomarus (big, round, red national insignia for the Japanese air forces) were of the standard two-part variety, done this way to make the model builder responsible for perfect alignment of the red center and white surround, instead of the decal manufacturer. I thought the Hasegawa decals looked a little thick, and I had recently bought some perfectly aligned, one-piece, red and white hinomarus by the Polish company Tech-Mod, whose decals had worked very well on the PZL-11.C and the Junkers J.1 models. Unfortunately, although the registration of the concentric white and red circles on the Tech-Mod set was perfect (the result, I believe, of computer graphics and computer printing, instead of the old-style multiple silk-screen process), these particular Tech-Mod decals did not work at all. 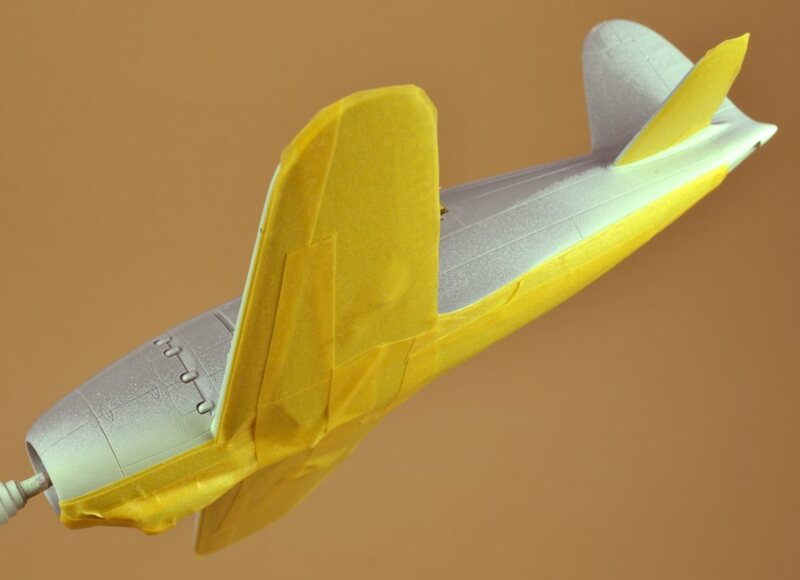 Paradoxically, they wouldn't slide easily, when first applied to the model (even with the application of Micro-Scale Micro-set decal setting solution), which made positioning them correctly very difficult, but then they would not warp as required to conform to to the mild compound curves of the fuselage, and ultimately would not stick down securely, once dry. 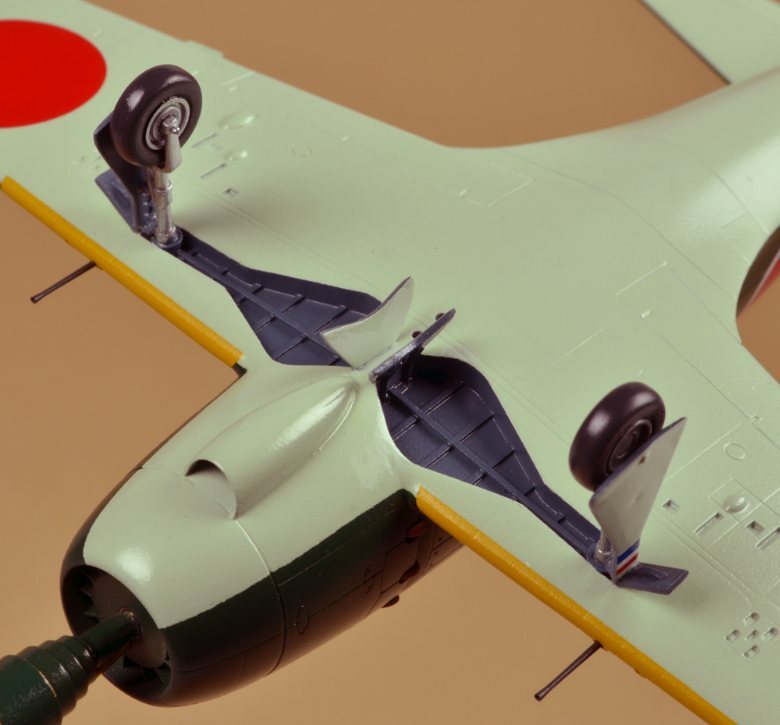 In the end, I had to scrub the hinomarus off from the tops of the wings and from the left side of the fuselage, and use the Hasegawa hinomarus, after all. After I applied nearly every decal, I got excited by how close to finished the model was becoming, and I forged ahead with installing nearly all of the details, before I photographed the decaled model. Oh, well. For the most part, the Hasegawa decals worked fine, although getting rid of the "silvering" (where air becomes trapped between the decal and the "Future" clear acrylic gloss) took a lot of application of MicroScale MicroSet and MicroSol. MicroSet is a wetting solution, that is intended to form a slightly slippery, air-free interface between the wet decal and the surface of the model. MicroSol is a solution that causes the carrier film (and ink) of the decal to soften, distort slightly, and then (hopefully) snuggle down into every concavity or engraved panel line on the model. These solutions work very, very well on MicroScale/SuperScale decals, and to varying degrees on other manufacturer's decals. I did make a mistake and ruined the next to last decal I applied: I tried to skip a step, applying MicroSol directly to the right side of the rudder, and then trying to apply the tail code decal on top of the MicroSol. The MicroSol softened the "Future" clear acrylic so much that it became sticky, and the decal stuck fast to the rudder, out of proper alignment. Try as I might, I could not loosen the decal, and it tore into pieces. I had to scrub it off. I thought about trying to piece the tail code together from a set of TechMod white, Japanese character decals, but they would not have exactly matched the size and style of the Hasegawa decal on the left side of the rudder. After a little internal debate, I logged on to eBay and bought another Hasegawa Jack kit, just to get the one decal I needed. Exorbitant, I know, but after all this effort, I chose to spend the additional $16.00 to get the matching decal. Part of the final assembly involves installing the landing gear. 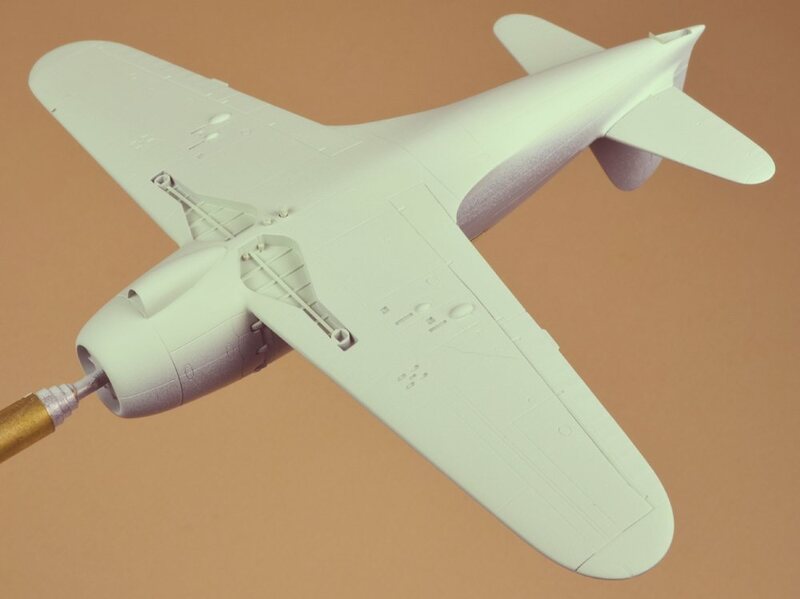 This can be a tricky step, because the goals are to 1) get the landing gear to attach to the aircraft as symmetrically as possible and 2) to get the model as it rests on the wheels to be symmetrical, as well. I did a pretty fair job of getting the landing gear struts to align with each other, have the same amount of toe-in, and be in good tracking alignment, where the wheels are as close to parallel to each other as possible. 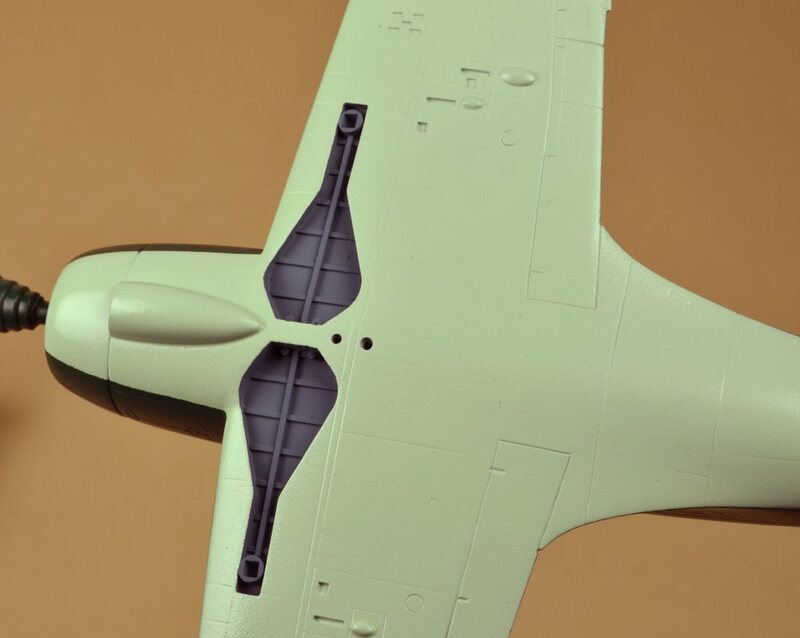 Unfortunately, setting the model on a piece of glass (a very flat surface) revealed that despite my best efforts, the left wingtip was about 1/32 of an inch lower than the right wingtip. Not noticeable without applying a ruler, but annoying. Once the inner landing gear doors were installed, at the correct angle to the wings, I discovered that the fuel tank would not fit. I'll have to plug the holes in the bottom of the wing. To the wings I added the pair of turned brass 20mm cannon barrels, and a pitot tube made by filing down the tip of a brass wire, to simulate the typical stepped-down appearance of pitot tubes (air speed sensor). With the last decal applied, I airbrushed a final coat of "Future" clear acrylic on to the decals. 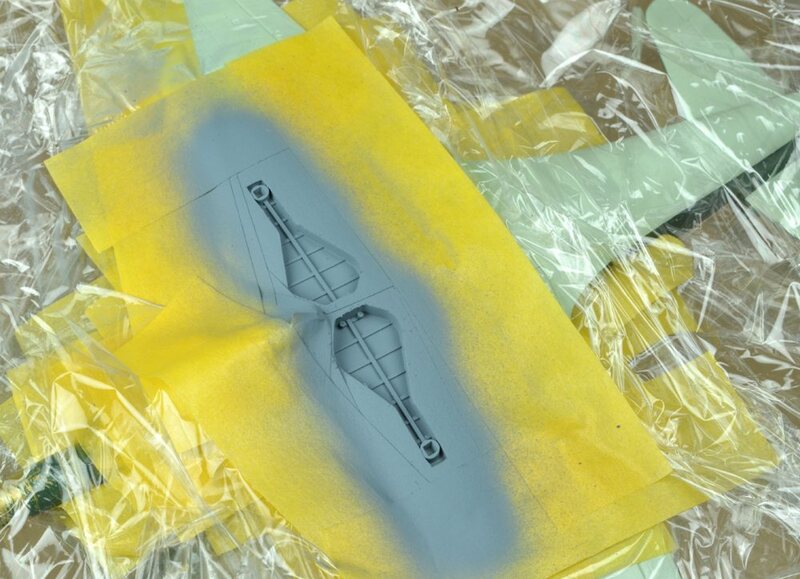 This step is necessary because the Testor's Clear Flat Lacquer finish will appear differently on the raw decals versus on the "Future" clear acrylic. Also, where I had to hand-brush a little touch-up Humbrol paint on different parts of the model, I needed the "Future" to darken this raw Humbrol paint to match the Humbrol already under layers of "Future". In the close-up picture of the landing gear above, if you look very closely at the far inner landing gear door and at the IJN Pale Grey at the front wing root, you can see the raw Humbrol No. 122 Pale Blue touch-up paint. Once the final coat of "Future" was dry (overnight), I installed a length of monofiliment from the hole I had drilled in the top of the vertical fin to the mast at the top of the canopy, to represent the antenna wire. Then, I airbrushed the Testor's Clear Flat Lacquer over the entire model. Next came removing the masks. This can be a nerve-wracking step, because after all of these hours of work, you don't know how the canopy is going to look, until the masking tape is removed. 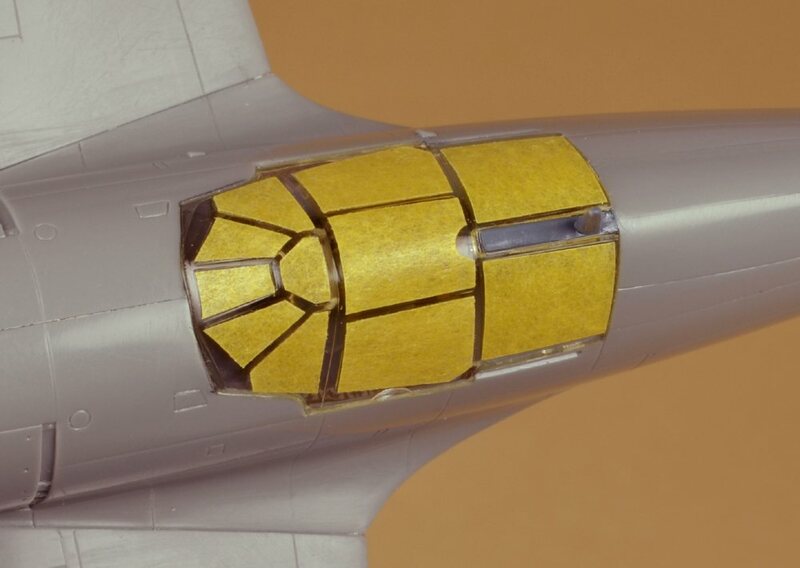 Sometimes, despite my best efforts to clean the interior of the model thoroughly (before installing the canopy), loose debris inside the fuselage works its way on to the inside of the canopy, is very visible, and is usually impossible to dislodge. Sure enough, after removing the masks, I could see several tiny bits of debris (and one huge spiral of drilled plastic from some earlier step). I was able to gently shake and tap the spiral out of sight, for now, but the tiny bits on the inside of the canopy seem to be permanent. This is where the project decided to get a little more interesting. While cleaning a little masking adhesive off from the canopy, I dislodged the monofiliment antenna from the front mast. There is no way to reglue the monofiliment to the mast with any tension on the monofiliment; I needed to install a new length of monofiliment. While installing the new antenna, I dropped the monofiliment, anointed with superglue, on to the fuselage near the hinomaru on the left side. 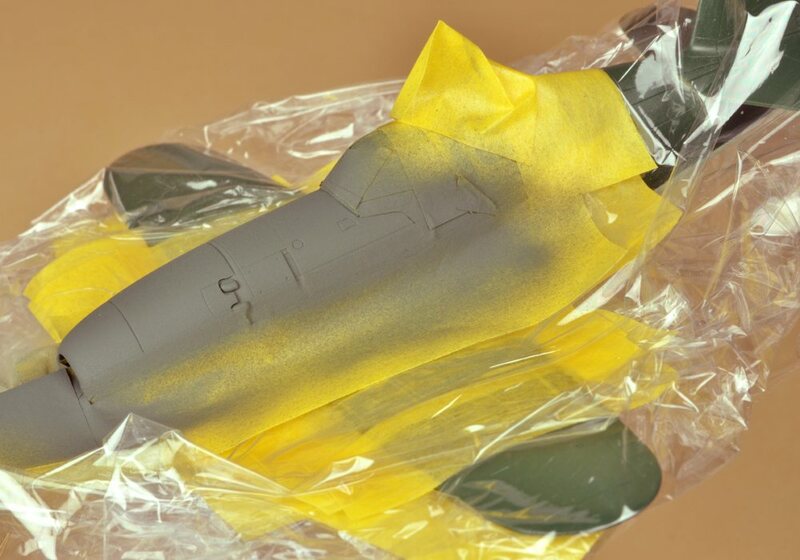 This required scraping the superglue off of the fuselage, which then required airbrushing more Humbrol No. 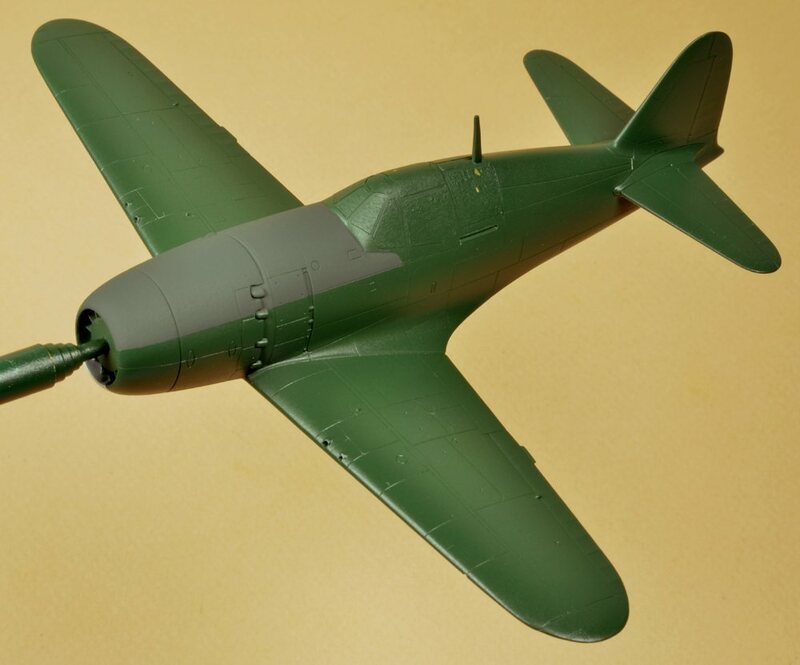 30 Matt Dark Green (I took this opportunity to hand-brush touch up several small instances of decal silvering on the wings and fuselage). Touching up the paint with Humbrol No. 30 Matt Dark Green required that I overspray the new Humbrol with "Future" clear acrylic, to give the raw Humbrol the "wet" look that matched the rest of the Humbrol. Notice how this affected the Testor's Clear Flat Lacquer. Fortunately, more Testor's Clear Flat Lacquer overcame the wet look. After I removed the Tamiya canopy masks the first time, I stacked them up on a corner of a piece of cardboard, not intending to use them again. As a result, they were no longer suitable to re-mask the canopy, before I started the touch-up process. 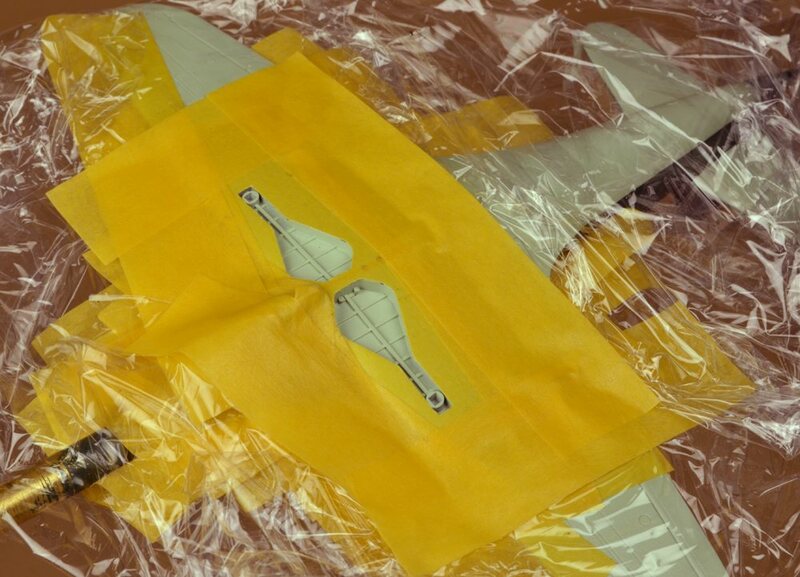 However, the old masks were useful for cutting the new masks, by applying the old masks on top of fresh Tamiya tape and using the outline of each old mask to guide the cutting of each new mask. Below are shots of the Jack after airbrushing the (hopefully) last application of Testor's Clear Flat Lacquer. I think we're done here. 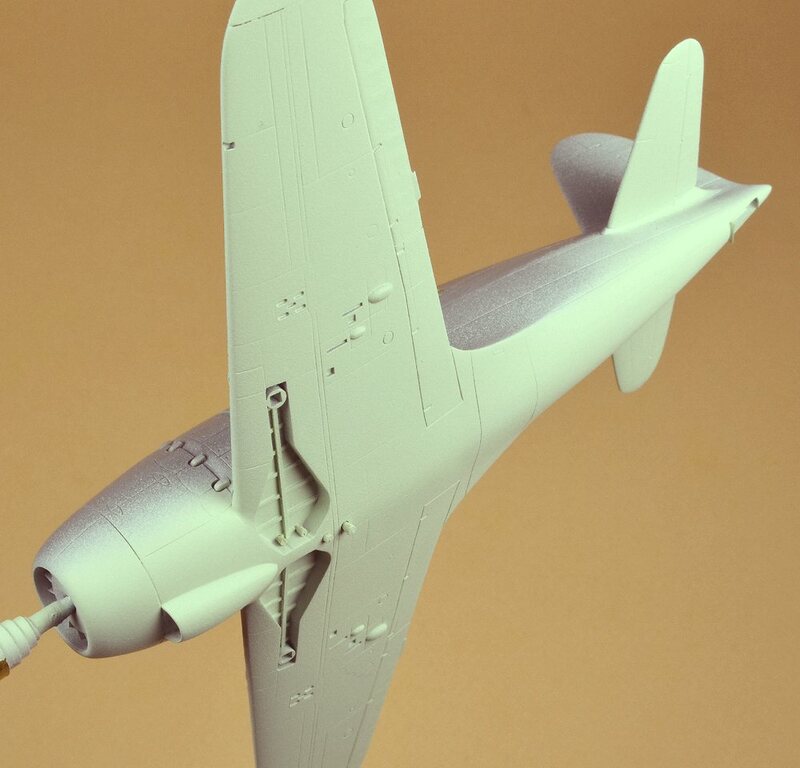 To see the usual gallery of shots of the finished model, please go to the PROPS-WWII tab of the AIRCRAFT page. Some quick statistics on this project: I started construction on June 2, 2012 and finished on October 28, 2012, a period of 21 weeks. During that period, I estimate I spent 24 to 26 hours building, painting and decaling the Jack. (This does not include the time spent photographing and posting the model-building progress on this website, which was possibly 28 to 30 more hours.) 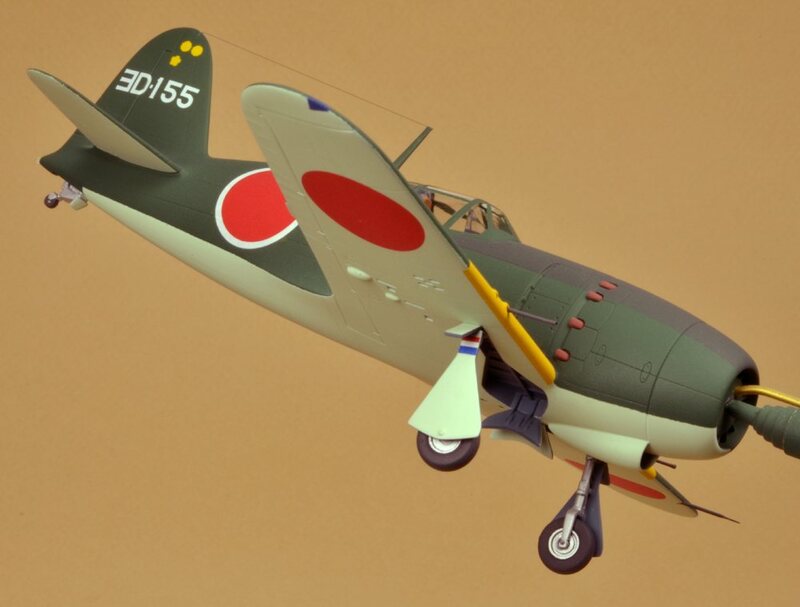 The cash spent directly on this model involved two Hasegawa kits at about $16.00 each, one set of ill-fated TechMod decals at about $9.00, a dozen different Humbrol and Testor's paints at about $27.00 total, and two reference books specific to the Jack at about $45.00 total, for a grand total of about $143.00. This works out to about $5.50 per hour of construction time, which is about the hourly rate of viewing a two hour film at the movie theater, not counting transportation and concessions costs. Fairly reasonable value for entertainment, I think, plus it keeps me off the streets, away from mischief, and where my wife can monitor my behaviour. With nearly every model I complete, I know from experience that I will react to some degree with a sense of letdown at the outcome. No model I finish ever achieves the desired level of perfection I envision as I am building it. My assembly and scratchbuilding skills are significantly higher than my painting and decaling skills, so I feel more optimism during the first half of the effort, than during the second half. Immediately after the model is finished, my eye is compulsively drawn to all of the flaws and failures in fit and finish, inhibiting the pleasure I derive from seeing the completed model. 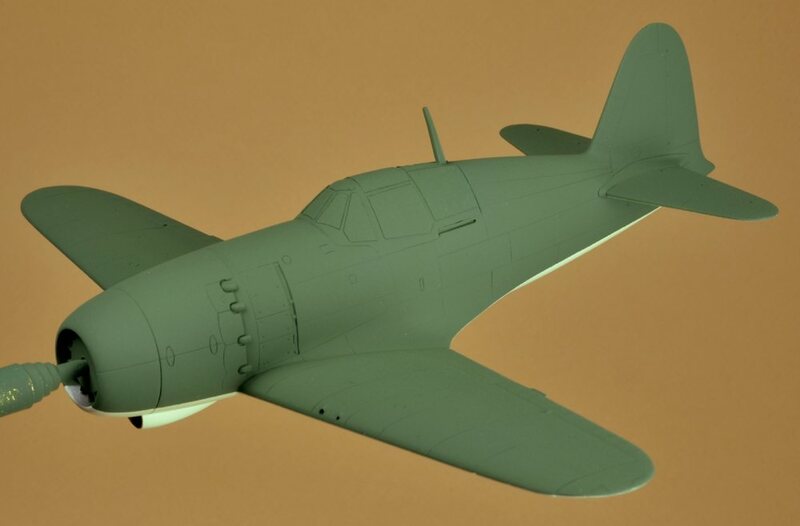 And while I enjoy most of the process of building models, I don't build for the pleasure of building, I build for the pleasure of owning the finished result, and of adding it to the rest of my 1/72 scale models. 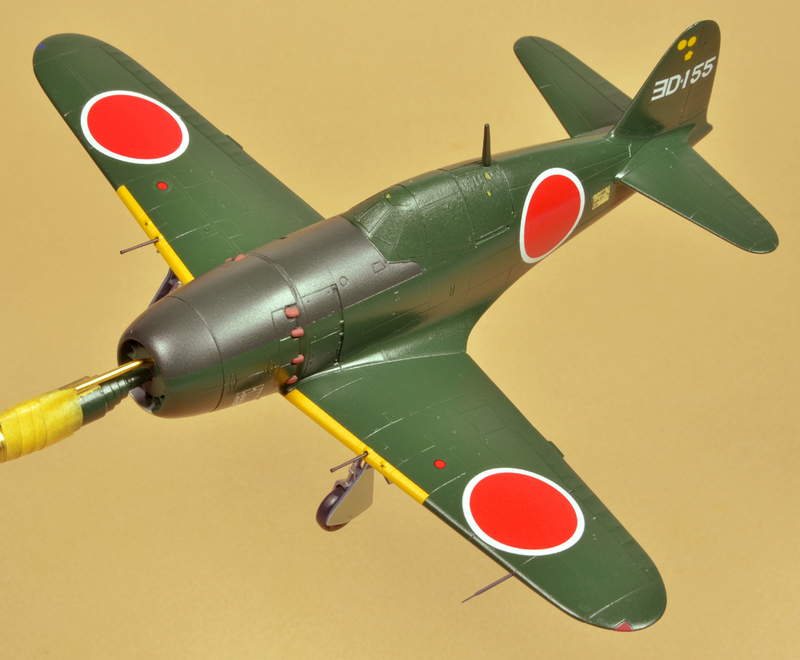 The Hasegawa Mitsubishi Jack model was a below average model-building experience for me. The assembly went well, I thought, but the error with the airbrush parts mismatch and the resulting coarse first paint application set a disappointing tone for the rest of the process. I was less than happy with the results of the masking between the two camouflage colors, and at the canopy. The decals were a real setback; I don't remember the last time I had to scrub off defective decals. 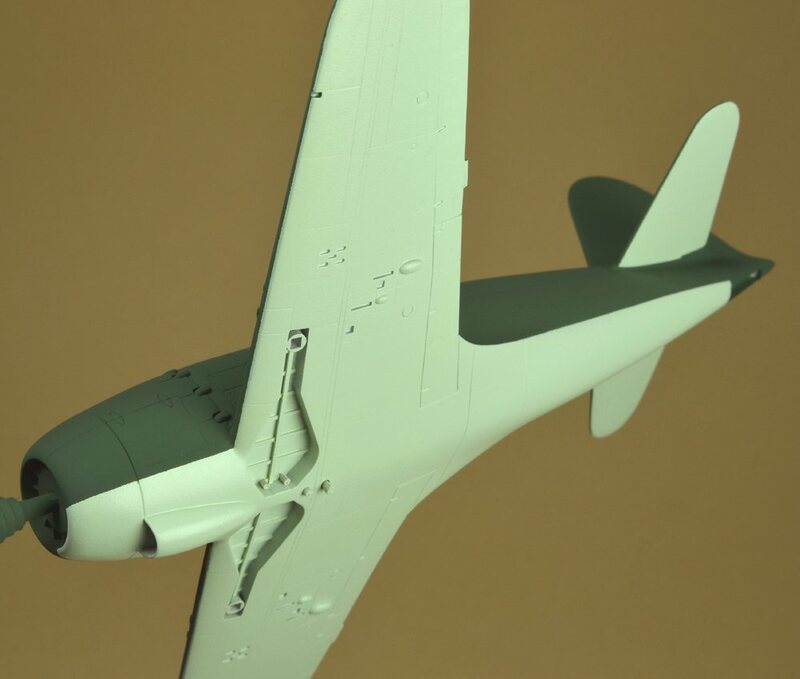 And the need to repair the finish, required by smearing superglue on the fuselage during the installation of the second monofiliment antenna, was really demoralizing. As a final insult added to injury, all of those Testor's Clear Flat Lacquer coats ended up giving the model a chalky, frosted appearance. Fortunately, time has taught me another truth about my innate nature: in two or three months, when I view the Jack again, in the model display cabinet, I will have largely forgotten much of what a struggle it was to build, paint and decal. The flaws won't be quite so obvious, and I will begin to think it looks pretty OK, after all. And best of all, another aspect of my innate nature, my hopeful optimism about the next model I build, will help me believe that this new model is going to go really well. Reading through this text a couple of days after writing it, I see that the overall tone of these conclusions sounds unduly negative and whiney; that wasn't my intention. A better summary of this experience would be as follows: building the Jack was like a well-played, hard-contested game, against a worthy challenger, which in the end I won, but not easily. I'm eager for the next game to begin.